A gripping story of man pitted against nature's most fearsome and efficient predator. Outside a remote village in Russia's Far East a man-eating tiger is on the prowl. The tiger isn't just killing people, it's murdering them, almost as if it has a vendetta. 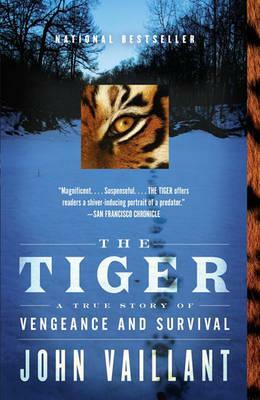 A team of trackers is dispatched to hunt down the tiger before it strikes again. They know the creature is cunning, injured, and starving, making it even more dangerous. As John Vaillant re-creates these extraordinary events, he gives us an unforgettable and masterful work of narrative nonfiction that combines a riveting portrait of a stark and mysterious region of the world and its people, with the natural history of nature's most deadly predator.